Researchers from five laboratories and a private company recently spent two days in blistering 100 degree heat testing radiation detection technologies amidst cargo containers. The 15 researchers demonstrated the feasibility of using gamma-ray and neutron imaging detectors to identify radioactive materials using the Laboratory's cargo container stack testbed. "The purpose of our test was to develop the concept of operations for deploying to a real-world port or on a cargo ship," said LLNL physicist Morgan Burks, the host for the exercise. "Each imaging system explored different search methods in order to optimize the detector's speed and sensitivity. "The ultimate goal is to develop technology suitable for searching a large shipping vessel for radioactive material. This particular test is a way for the participating labs to characterize their equipment before taking it onboard a ship," Burks said. Three national laboratories—LLNL, with its GeGi germanium gamma-ray imager developed over the past decade; Lawrence Berkeley and Oak Ridge —tested gamma-ray detectors, as did a commercial firm, H3D. Sandia National Laboratory-Livermore, participated in the tests with a neutron imaging technology. And the Remote Sensing Laboratory from Andrews Air Force Base used hand-held scanners (non-imaging) as a benchmark with the other imaging technologies. LLNL riggers scaled the 32-foot-high testbed – outfitted with 15 shipping containers that are 8 feet tall by 8 feet wide by 20 feet long – to place the radioactive sources. 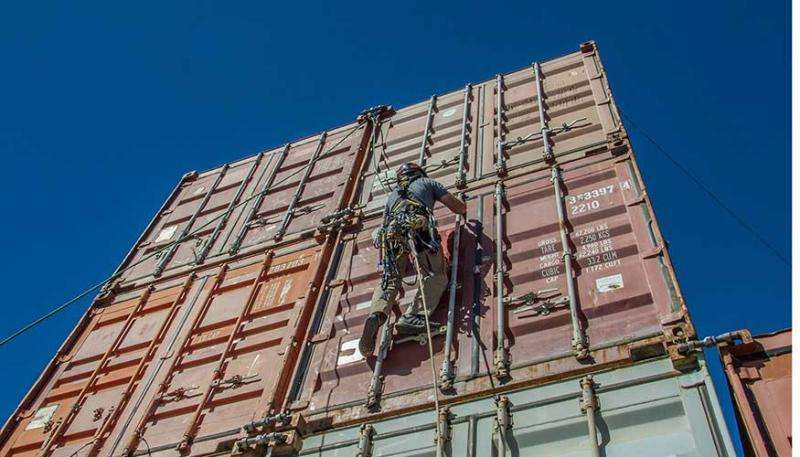 Riggers from the Remote Sensing Laboratory also climbed the containers to use their hand-held scanners to check the sources. One of the detectors used during a radiation detection exercise last week was Lawrence Livermore’s GeGi germanium gamma-ray imager that has been developed over the past decade. Shown from left are former LLNL employee and current Oak Ridge National Laboratory employee Klaus Ziock, LLNL post-doc Jonathan Dreyer and LLNL graduate student Lena Heffern. One search method involved performing a quick scan around the testbed's entire perimeter, before returning to focus on the hot spots. Another method took detailed images from various locations, then triangulated the precise location of the sources. "Most of the radiation detection systems were able to not only locate which container held various sources, but to indicate in what part of the container the source was placed – front, back, near the floor, ceiling, etc.," Burks said. Some of the challenges for the testing included hidden radioactive sources very high up in a stack, or there may be several intervening stacks, which can attenuate the signal. Burks termed the two days of testing as "a very valuable experience for all of the teams." "It will help us for real-world deployments next fall. We gained experience working in harsh conditions (101 and 104 degree Fahrenheit temperatures) and learned from each other about various search methods and the unique capabilities of gamma-ray and neutron imaging systems," he said. During the 2016 fiscal year, the teams will perform dockside radiation tests in the Savannah, Georgia area, checking shipping containers for radioactive materials. They also will conduct measurements on ocean-going ships while they are at sea. The GeGI Gamma-ray Imager is a commercially available detector from PHDS Co. in Knoxville, TN. The GeGI is used in a wide range of applications from security, nuclear material management, nuclear power to waste management.